Many times people give up on these projects, here is a video…a great example of when you are into a restoration, you are all in. 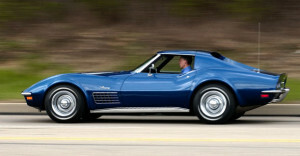 Here is a nice video of a restoration of a 1976 Corvette. The difference between pre-1976 Corvettes and post 1975 Corvettes is that many of the fiberglass parts were changed to metal and the metal gets rust, like any older car. Evident in the video, you will see plenty of rust. Rust is a tricky animal and you have to make sure that you get as much of it out, and treated because, it will be a re-occurring issue with post 1975 Corvettes. The Floor pan for one is someplace that you have to check when purchasing these vintage Corvettes. Get down in there and check it out. Make sure that not only you don’t have to replace the floor pan, but if you do, there is plenty of good metal around the floor pan. If not this could set you back a few bucks, and it will most certainly be something you will have to do, before you do anything else to the car. Kind of like fixing the roof of the house, before anything else is done to the home. Very similar…check out the video! C 3 Corvette Door Panels, The Best Bet!